I don't get invited to parties. That's not an "Oh woe is me" statement. I'm always uncomfortable at a party, anyway, unless I know people willing to let me hang around with them. I don't do the wander up and commence speaking very well. I can hold my own in a conversation, but initiating it is not something I'm remotely comfortable doing. Plus, as I've aged, the idea of a party where the entertainment is standing around talking while eating and drinking, is not appealing. I far prefer parties where we play games. And, I don't have friends in the area who do parties where I feel comfortable. So, I read of others' Halloween parties and am happy for them it was well attended and happy for me that I stayed home. But, I'm going to Disney World in October and part of the trip is to attend Mickey's Not-So-Scary Halloween Party. I'm looking forward to it. One of the things you can do is come in costume. That's something of a conundrum for me. I did a minion costume years ago because I had a rheumatology appointment on Halloween, but I haven't dressed up since. I still have all the pieces to do that costume. Then, my friend, Meredith sent me to JoAnn Fabrics by showing me pajamas in minion designs at Wal*Mart. Remember, I came home with two fabrics and a pattern for a shirt. I could wear the minion hat and one of the two shirts I intend to make, maybe get some white gloves. I could keep a crib sheet with me which has "minion speak" on it and reply to comments with minion-ese. All it would cost is the money and time to make the shirts. 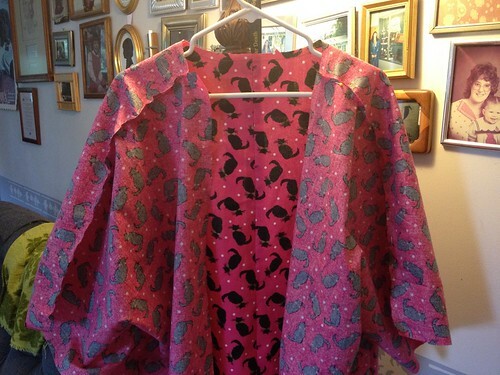 In order to get to the shirts, I needed to finish the jacket I cut out last year but never sewed. I'm notorious for grand ideas which never get finished, but I've simply told myself no minion shirt until the jacket is done. 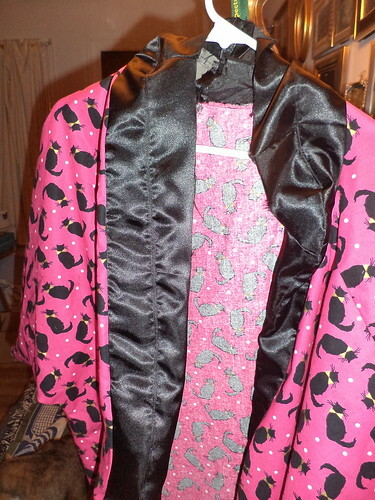 I've actually made steady progress on the jacket. I have help. Every outfit must have cat hair on it. It goes together fairly quickly, with long seams joining front to back. The hard part is the trim. It's a wide band which can be in the same color, but is shown with a different color. I decided on black satin. I'm very pleased with the result. The trim has to be lined. 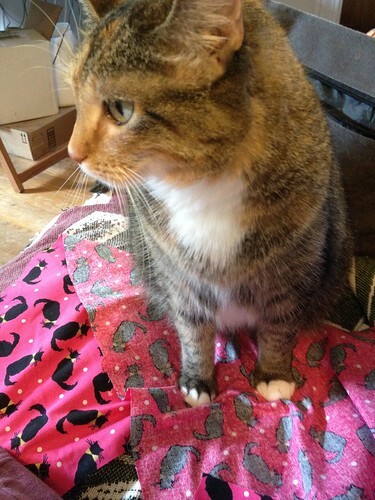 I am used to fusible interfacing; which is easy to apply. But I worried satin wouldn't take very well to the heat and steam needed to properly fuse the interfacing to the stain. I worried that I'd wind up with very distinct iron imprints in the satin. A friend who actually makes costumes said that wouldn't be the main problem. Satin would pucker as the interfacing cooled. So, it was sew-in interfacing. This brought up another issue. Did I have any? I pulled out the box marked "Interfacing and sewing assists". There was a bit on top in the box, but not nearly enough to put interfacing in all the trim you see. Then, I spied a bag on the floor of the closet. 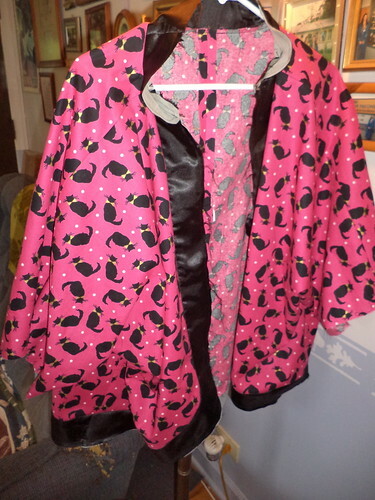 Inside was more interfacing than I needed for a dozen jackets, including sew-in. I'd purchased interfacing to go with the minion shirts, but that's going at the bottom of the pile. I need to use up some of the other pieces I have. Oh the problem of accumulation in the life of a sewer. Do I or don't have have enough interfacing or the right color of thread. Better buy some just in case. I have to stop "just in casing". I encountered an issue at the neck. I don't know if I didn't cut the right pattern piece or what, but the trim band at the neck was not large enough to go around the neck without making pleats in the jacket neckline. I dug out the pattern and I seem to have cut out the right piece. I tried pinning several different ways, but none of them worked. I decided I needed to cut a rectangle piece to pin across the back of the neck. Digging out the leftover satin, I discovered someone had peed on it. I have no idea when, but the odor was unmistakable. I cut two squares, tossed the rest in the wash, and hand washed the pieces I needed. I sliced the neck piece in half, sewed this extension into the trim and finished pinning the trim to the jacket. The other piece went into the facing of the trim since you use the same pieces for the facing. It fit fine with an additional 3 inches of fabric. 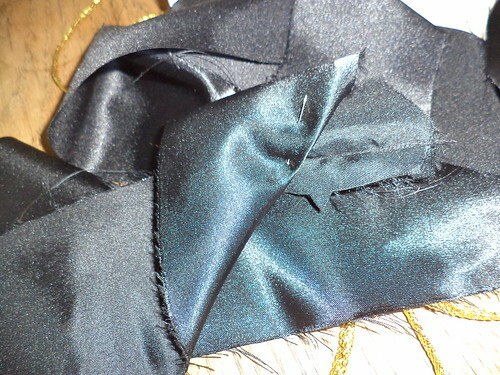 With this being black satin, you won't suspect this piece wasn't supposed to be there to begin with. The next step was to prepare the facing. I did the same thing with the facing as I did with the trim; added the additional 3 inches. I'm sitting in the recliner, Mija purring next to me, and I'm having problems getting the facing to match around the bottom of the jacket. Something is off. I unpin the facing and lay it flat on the table. When I was pinning the facing pieces together, I twisted one side of the bottom facing when sewing the pieces together. I was quite frustrated and had to set the project aside. How could I have missed this? 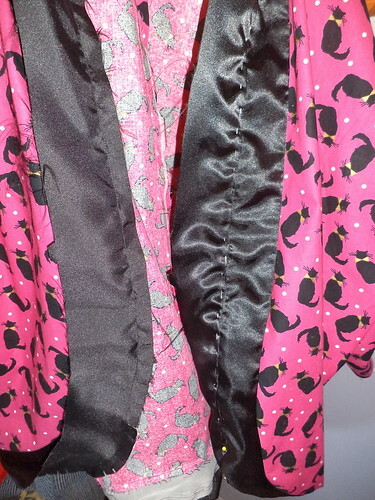 Taking a seam apart is a problem, but doing it on satin was double trouble. It's easy to make the satin look awful when you have to remove seams. I couldn't cut another piece because the fabric was in the middle of the laundry chute and I really don't know if I can adequately remove the smell. I'm hopeful because there's enough satin to do something else with if I can salvage it. What to do. What to do. I finally decided to use fusible interfacing to save the piece. This is the facing. It won't be primarily visible. This is also along the bottom inside of the jacket. I'm not going for a prize here. I'm going for having it done. So, I cut the facing apart, took a hunk of fusible interfacing and "fused" the two pieces together, after making sure I had them untwisted. The fused pieces didn't pucker as much as I was expecting, thankfully, so they pinned nicely onto the trim. Once the facing and the trim were sewn together, you need to understitch the facing to make sure it doesn't roll forward. I remember, from my high school sewing days, that understitching was recommended for all facings but you rarely see it in the instructions. This jacket has that step. I clipped the curves and decided the best thing to do would be to pin the facing to the seam to make understitching easier. In doing this, I encountered another problem, my RA. July was a tough month for me. There were bouts of achy joints. I haven't had it cause problems with my cross-stitch or sewing until now. I would hold the facing to the left, smooth it, and with the right hand, pin it in the direction I was going to sew. The holding and smoothing put more stress on my left wrist than I was expecting. After pinning half of the facing, I couldn't do anymore. The pain was too great. I wound up pinning the rest of the facing over two days and understitching last night. This is where the jacket is today. I need to press the facing to the inside. I'm going to add gold braid at the junction of the trim and the jacket, because, why not. That will pick up the gold in the bow ties of the cats. I should be able to stitch down the facing at the same time I attach the braid. The hem on the sleeves is just a simple 5/8 inch hem, but I'm thinking of looking through my trim box to see if I have any black seam binding. I think that would look great. I need to sew a "Made by" label on the neck facing, too. There's hard pinning upcoming with attaching the braid so I have to be mindful of how my wrists and fingers feel. I really wanted gold piping but that's not made anymore, at least JoAnn Fabrics didn't have gold piping. I didn't want to spend $20 in gas searching for something which didn't exist. I probably could have found it on the Internet, and given how long it's taken me to get this far, I wouldn't have been waiting on something to complete the jacket, but what I got is distinctive. So now my costume for Mickey's party has changed. I was going to bring this jacket to Disney anyway. I could put a pink shirt under it and wear it with black jeans, which I was planning on packing anyway. Then, I could get black cat ears on a headband. The Halloween costume stores which spring up around the holiday should be opening soon and I'm positive I can get black cat ears. I don't know what to do. Minion or black cat. Minion or black cat. I guess I see how quickly the minion shirt goes together and how it looks.